The International Dendrology Society is an organisation for tree enthusiasts from around the world, most of whom grow trees in their gardens and arboreta, and many join the tours which are regularly run to many parts of the world, where trees feature strongly in the native flora, particularly those hardy in western gardens. IDS had already visited Bhutan in 2004 and explored the more accessible parts of western Bhutan, but felt that a second tour would be popular, to see more of the colourful culture, extensive forests and diversity of conifers, oaks, rhododendrons and other woody plants with which Bhutan is richly endowed. The organiser of the 2014 tour was Anke Mattern from Germany, who had visited RBGE to discuss the plan with me two years ago. I strongly favoured a focus on east Bhutan, entering Bhutan from Guwahati in Assam, and later traversing Bhutan to the capital Thimphu, to visit the Royal Botanic Gardens at Serbithang, before departing out of Paro airport. My appointment as ‘guest botanist’ was confirmed and with some trepidation I spent many hours brushing up on Bhutanese trees, studying the Grierson & Long field books from the 1980’s, and photographing herbarium specimens of oaks to refer to in the field. On 12 October our group landed in Guwahati close to the massive Brahmaputra River. We had 18 enthusiasts from many countries, with three students: Jonathan Davies-Coleman from RBGE and Wella Chubb and Katie Nichols from Cornwall and myself. After entering Bhutan through the ceremonial arch at Samdrup Jongkhar we met our four Bhutanese partners – tour organiser Tsewang Rinzing, a senior Bhutanese botanist and friend from the 1980’s Raling Ngawang, Thimphu herbarium curator Rinchen Yangzom and her assistant Tshering Dorji. Basing ourselves in the capital of East Bhutan, Tashigang, dominated by its historic Dzong (both religious and administrative in function) we prepared for a trek up to the remote valley of Sakten, close to the border with Arunachal Pradesh. Our party being extremely diverse in ages, and a number of those never having camped before, Sakten Tours indulged us with luxury trekking with comforts such as hot water bottles and roaring camp fires with local villagers in traditional costumes brought in to dance and sing in the evenings. The daily treks were relatively leisurely, giving us ample time to study and photograph plants and collect specimens for the Thimphu herbarium. Each day I led the ‘student group’ which included Raling (nicknamed the ‘Professor’ for his excellent local knowledge of plants) and some of the non-students and had much enjoyment over our daily botanising (though we inevitably lagged well behind the others). Sakten proved to be a beautiful village with broad meadows dotted with yaks, surrounded by forested mountains in all directions and overlooked by the monastery or ‘Lakhang’. 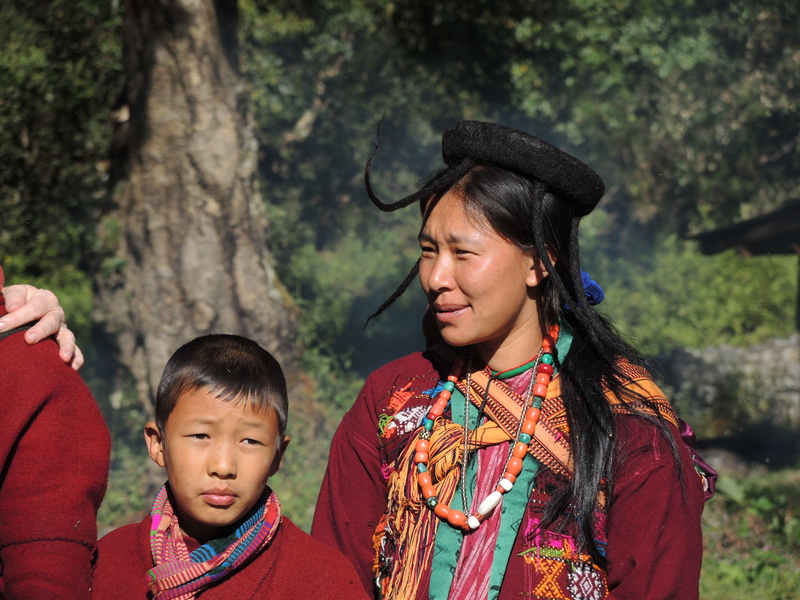 The delightful local people (the Brokpas) are famous for their colourful costumes and unique hats made from Yak wool – like French berets but with 5 tails hanging down for drainage. 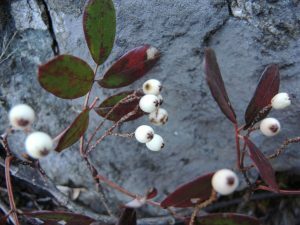 In the Fir/ Rhododendron forests were many plants of interest to our group, most identifiable, even the non-flowering rhododendrons such as R. grande which Jonathan named successfully using the Flora of Bhutan – 24 species in total. Spectacular trees included abundant Pinus bhutanica (a species first described by RBGE botanists), Hemlock (Tsuga dumosa), Magnolia campbellii, Fir (Abies densa), Birch (Betula utilis) and many interesting shrubs such as Mahonia, Juniperus, Rosa and so on. Many of the deciduous trees, particularly the Maples, were coming into fine autumn colour. A small Rowan caught our eye, with beautiful white flushed pink berries, and we were able to identify this as Sorbus macallisteri, known before only from Arunachal Pradesh, and named in honour of Hugh McAllister, the British Rowan expert who later confirmed the identification. This was a most unexpected addition to the Bhutan flora. After returning to the comforts of Tashigang which lies in a deep hot valley with a totally different flora including Cycas pectinata and the tropical Duabanga grandiflora, we visited the spectacular stupa at Bomdeling before starting our four day journey to the west. Our second major discovery came after our stop in Mongar, following the Shongar Chu valley past the ruined Shongar Dzong. Our old friend Sadruddin (who teaches botany in Sherubtse College near Tashigang) had told us about a mystery tree in east Bhutan with peculiar fruits he had tried unsuccessfully for many years to identify, so when our colleague Raling suddenly shouted out that here was the tree right beside our road, the excitement grew. He too had known the tree all his life under the local name Golonang Shing but now was our chance to collect and work out its botanical identity. 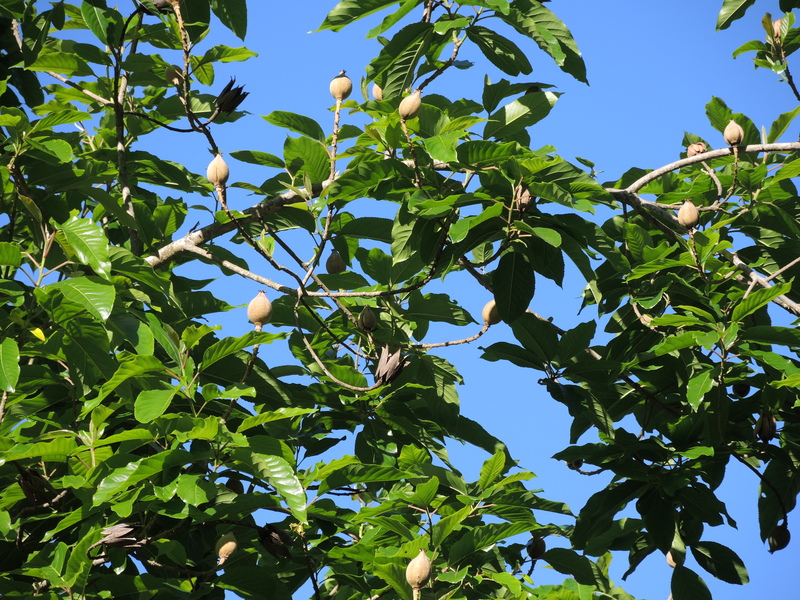 Its peculiarity was that the large fruit capsules, containing many winged seeds, dehisced first from the top down, then later from the bottom up. Browsing the Flora of Bhutan drew a blank so later I sent images to David Boufford in Harvard, specialist on Chinese plants, who solved the mystery – the tree is Itoa orientalis in the tropical family Flacourtiaceae. Previously it was known only from China and Vietnam, so it is new not only to Bhutan but the whole Himalaya. Our journey to Thimphu was punctuated by another, two-day camping trip in the upper Dang Chu Valley north of the Pele La. Here was another remote village (Tokaling) rather similar to Sakten, but with the bonus of a health-giving spring, whose water was used in outdoor wooden baths heated for us by boulders from the camp fire. However, for botanists it was the spectacular giant Cypress trees (Cupressus himalaica) which dominate the valley, both close to houses and in natural forest in a nearby valley, which created huge excitement. The very durable timber is highly prized for Dzong construction, and the villagers expressed their fears that for the reconstruction of Wangdu Phodrang Dzong, recently completely destroyed by fire, their precious cypresses would be felled. We agreed to try to help to save the trees and IDS will try to raise funds to grow young trees for replenishing the wild population. Finally we reached the ever-expanding capital Thimphu where progress with the Serbithang garden was admired before leaving Bhutan on the spectacular Druk Air flight from Paro. Glad that you found Sorbus macallisteri – justifies my naming it in an article on Bhutanese Sorbi. In 2008 when on the West Kameng/Tawang side but only a mile or so from the border. In 2012 I saw a single sterile plant north of Menchukka – this plant was unusual in havin g almost exclusively trifoliate leaves. Itoa interesting, I’ve mainly seen it around Sapa in north Vietnam. Tsenden impressive. Looks about the same girth as the largest Cupressus gigantea near Lingshi. Nice story. My hobby is to measure tree heights… How tall (about) were the giant cypresses? In a correspondence with Aljos Farjon, he states the correct scientific name for Bhutan cypress is Cupressus cashmeriana. This is because when E. Carriere was working on naming Bhutan cypress, he wrongly wrote the provenance of the material as from Kashmir. And laws of botanic nomenclature dictate the name of the first description of a species have to be retained. Appreciate your view on it as you have used C. himalaica in this write up. 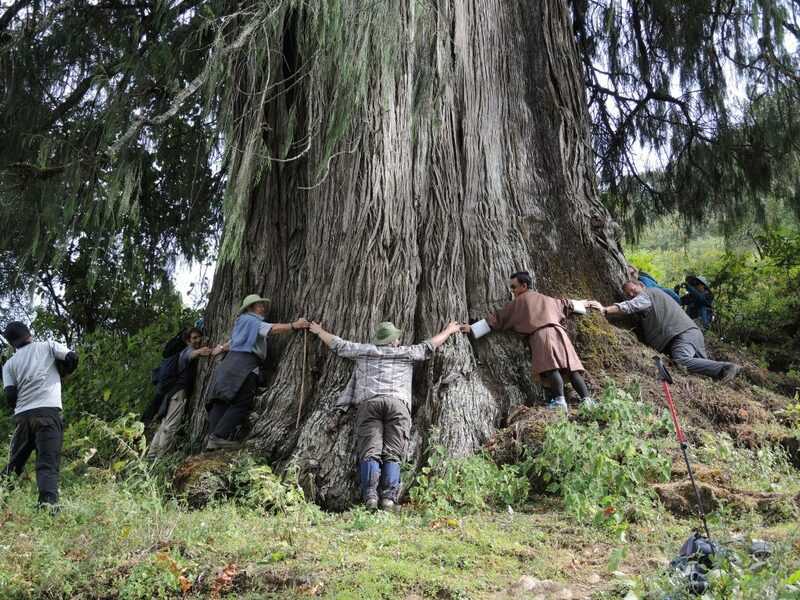 The reason I am writing to you today is to seek the permission for use of the picture Bhutan cypress at Tokaling with people measuring the girth. I like to use it in a forestry book on Bhutan I am working on. Appreciate more if you can send me the original pic at phuntshonamgyel2011@gmail.com. Kind rgds.